“In Mattel, we have the best partner with the strongest track record of bringing great products and great stories together for a winning combination in the toy aisle. With these deals, we know that two of our most important tentpole films for 2008, ‘Speed Racer’ and ‘The Dark Knight,’ will be brought to life through products created by the most creative toy designers in the world,” said Brad Globe, president, Warner Bros. Consumer Products. The green flag drops on May 9th when Speed Racer makes his big screen debut in the newest project from writer/directors Larry and Andy Wachowski, the creators of the groundbreaking “The Matrix” trilogy, and producer Joel Silver. A live-action, high-octane family adventure based on the classic series created by anime pioneer Tatsuo Yoshida, the big-screen Speed Racer will follow the adventures of the young race car driver Speed (Emile Hirsch) in his quest for glory in his thundering Mach 5. It will feature other characters that fans of the show will remember, including Mom (Susan Sarandon) and Pops Racer (John Goodman), girlfriend Trixie (Christina Ricci) and his mysterious arch-rival, Racer X (Matthew Fox). “The Wachowski brothers said to me one day that they were always disturbed that their nieces and nephews could never see their movies. This was the first time all their friends, family and the kids in their lives could see one of their films. They wrote a pure family movie. It’s fun. It’s got great characters, great dialogue, and great stories,” said Silver. Mattel will tap into the action, characters and storyline to bring the film to life across a broad number of their product lines. With Speed’s Mach 5 leading the way, the leading die-cast vehicle brand, Hot Wheels, will feature a wide assortment of die-cast vehicles, race sets and track sets based on the film. Tyco, the leading remote control vehicle brand, will put kids behind the wheel of the Mach 5 with R/C vehicles and racing sets. Radica, Mattel’s newly acquired games and electronics division, will put the action in the hands of kids through products that let them take the wheel, literally. Additionally, a line of Mattel games and puzzles will capture the film’s action through board games, puzzles and a special-edition UNO card game. 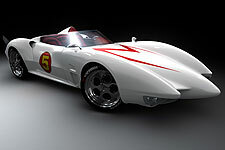 Speed Racer products are expected to begin arriving at retailers around the world beginning in late March 2008. On July 18, 2008, The Dark Knight, the second Batman film from director Christopher Nolan, arrives in theaters. Batman (Christian Bale) raises the stakes in his war on crime in Nolan’s The Dark Knight. With the help of Lieutenant Jim Gordon (Gary Oldman) and District Attorney Harvey Dent (Aaron Eckhart), Batman sets out to dismantle the remaining criminal organizations that plague the city streets. The partnership proves to be effective, but they soon find themselves prey to a reign of chaos unleashed by a rising criminal mastermind known to the terrified citizens of Gotham as The Joker (Heath Ledger). 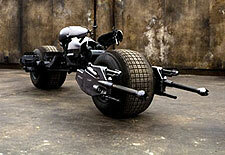 For their film-inspired product lines, Mattel will utilize the multiple elements introduced in The Dark Knight. A new Batsuit, a new vehicle in the form of the Batpod and multiple key action scenes that set the stage for inspired play. Mattel’s action figure line will feature Batman and the new Batsuit. Tyco R/C vehicles bring to life the speed and action of the Batmobile and the new Batpod. An entire line of action play items will allow boys to role-play being The Dark Knight. Additionally, Mattel will release a line of games and puzzles that will capture the film action through board games, puzzles and a special-edition UNO card game. Products based on The Dark Knight are expected to begin arriving at retailers around the world beginning in early June 2008.